The first full moon of May has passed so that means it’s soft-shelled crab season! Yes, it really does have to do with the lunar cycle. At this time of year a crab begins it’s molting season, which continues through September. After a crab sheds its hard shell, the soft shell is tender for only a few hours so the crab must be removed from the water immediately in order to prevent the shell from hardening. As you can guess this is a very delicate and time sensitive process to bring this delectable treat to the market. Really good soft-shelled crab is wonderful. The shell is not chewy in the slightest and the meat is sweet and succulent. I must admit that I didn’t like soft-shelled crab the first few times I had it because I found it too chewy and it seemed to have more shell then meat. Now that I understand how exact the timing needs to be I really appreciate good soft-shelled crab. This recipe begins with a basic fried soft-shelled crab and adds Chinese-style flavoring of garlic, ginger, scallions, and cilantro. For a spicy kick add sliced fresh Bird’s Eye Pepper. If you would like a little spice but not quite a tongue burning hot try dried Maras (or Turkish) Red Pepper, which has a nice sweet-hot flavor. Soak crabs in the buttermilk. Keep refrigerated for 20-30 minutes. In a shallow bowl, combine cake flour, baking powder, and ¼ tsp. black pepper. 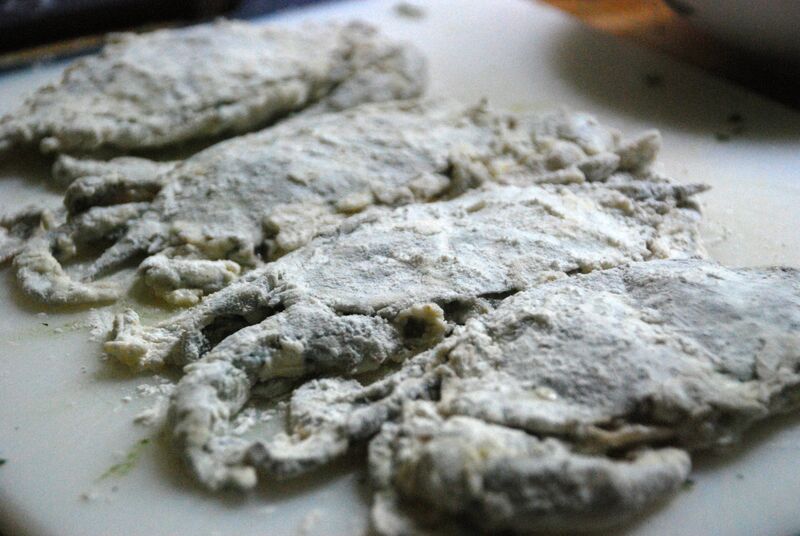 One at a time, coat each crab with the flour mixture. 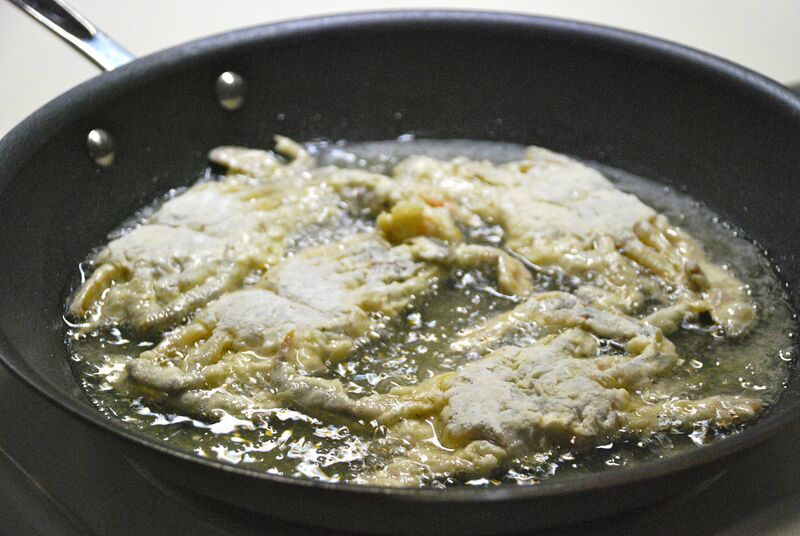 In a frying pan (I recommend using a non-stick pan), heat ¾-1 cup of oil. 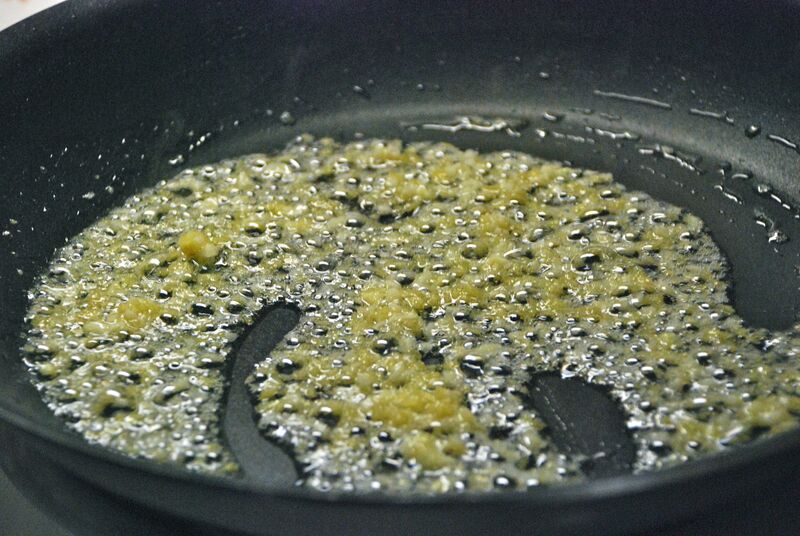 There should be enough oil to form a 1/8 to 3/16-inch depth of oil across the entire bottom of the pan. 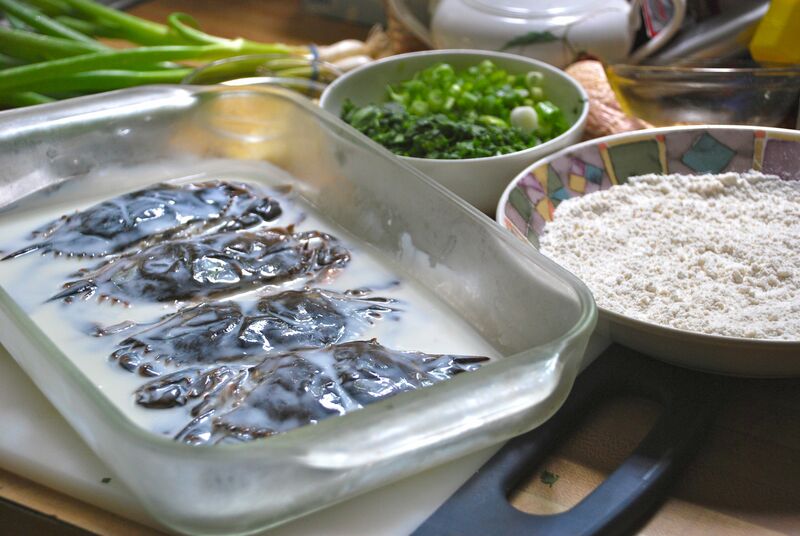 On medium-high heat, carefully place crabs in a single layer, with no overlapping, into oil and cook on one side for 3 minutes. The crabs should brown but not burn. Turn the crabs over and cook for another 1½ minutes. Remove crabs and place them on a paper towel. Using a pair of kitchen scissors cut the crabs in half (tail to head) and set aside. Carefully pour the hot oil from the frying pan into a bowl. Remove any residual browned flour crumbs with a paper towel, being careful not to burn your hands. 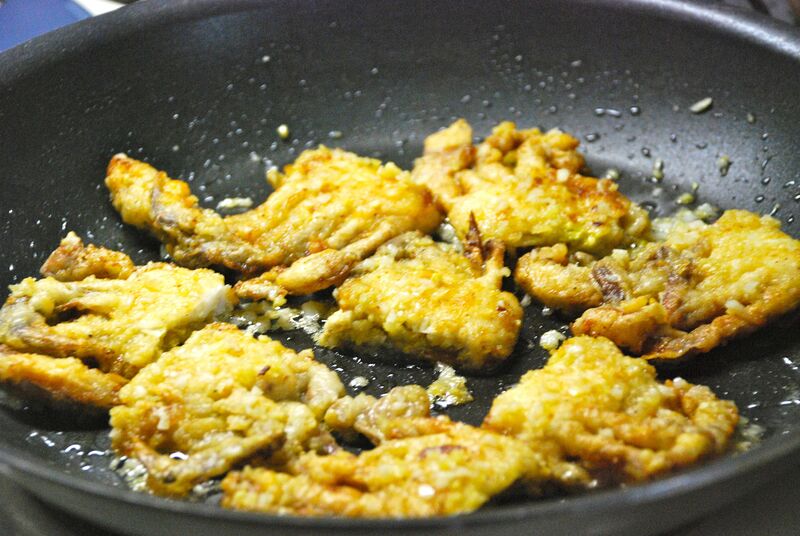 Lower heat to medium and return 3 tablespoons of the hot oil back into the frying pan. Add garlic and ginger, stirring lightly for 30 seconds so it sizzles but does not burn. Put crab back into pan sautéing lightly, flipping them over so the garlic and ginger coats the crab pieces. Add scallions, cilantro, ¼ tsp. black pepper, and Bird’s Eye Peppers or Maras Red Pepper. Sauté lightly so the crab is coated evenly with herbs. Serve while hot. Love it! Saw these on sale at Whole Foods/Legacy yesterday and REALLY was about to buy them but then thought…besides deep frying them, I needed a good recipe (YOURS). Thanks for the inspiration!! Pictures look great! 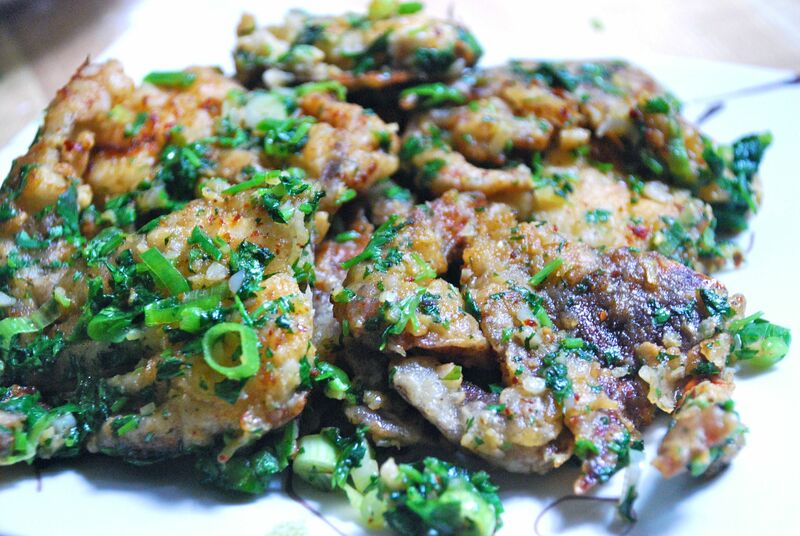 You are currently reading Soft Shell Crab with Ginger, Scallions, and Cilantro at Hestina's Kardia.